It was late, and the rain was really coming down. You pulled the collar of your coat up high and ducked inside the nearest dive to dry off your outside and warm up your inside. It was a bar like any other bar: low lights, blue smoke hugging the ceiling, a guy playing the piano over the murmur of low voices. Like most barroom piano players, he didn't look like much. But the way he tickled the ivories matched your mood. Slow and undulating, like your drink swirling in its glass. The songs were all familiar, but when played the way he was playing them that night, it was like you'd never heard them before. Ellington, Mercer, Hoagy Carmichael  whatever happened to those guys? Even those of us too young to have worn a fedora when they were fashionable have seen enough Bogart films to be familiar with the above mood. Whatever happened to those guys is that a pianist named Joe Augustine is keeping their music alive. 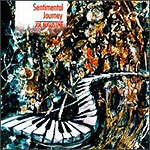 On his new album of solo piano, Augustine captures a feeling of lost grace or romantic elegance; listening to his playing you half expect Lauren Bacall to sit down next to you or for Frank Sinatra to sidle up to the piano and start crooning to the joint. It's not a perfect album; Augustine has a tendency, reflected in the title, to sometimes slip into cheap sentimentality. But when he's playing the standards  "Stormy Weather," "Crazy He Calls Me," "It's Only a Paper Moon," "Don't Get Around Much Anymore," "Smoke Gets In Your Eyes"  Augustine is on very solid ground. And even at his sentimental worst, Augustine is no mere Hit Parade. On every song, he improvises, putting his own twist on the composition. He has a wonderful ear for drama, gently building a song up to its natural break, and then slowly winding down. His playing is rich, with lots of use of the sustain pedal. This is a really refreshing album in that Augustine is no innovator and feels no need to be. There are no gimmicks here, just good, old-fashioned piano playing of the sort that never really goes out of style.